Provided photo This Crayex Corporation ornament is the latest in series of collectible “Made in Piqua” ornaments. The cost is $12. 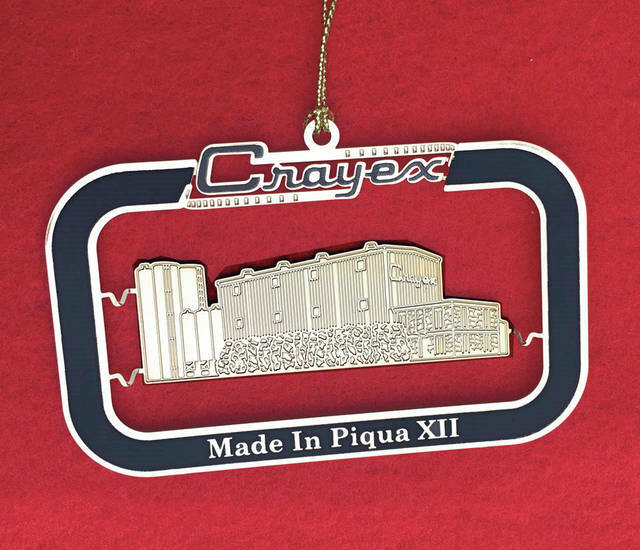 PIQUA — The Crayex Corporation is being featured on the 12th in a series of collectible “Made in Piqua” ornaments. The brass ornament features the front of the Crayex building, which is located on Commerce Drive. The “Made in Piqua” ornament series was started to honor Piqua’s landmark companies and each ornament comes in a box that was especially produced for the project by Piqua Paper Box Company. The cost per ornament is $12. The ornaments are now available at the Mainstreet Piqua office, 326 N. Main St., as well as at Readmore’s Hallmark, 430 N. Main St., and Apple Tree Gallery, 405 N. Main St.
PIQUA — The Piqua City Schools District will offer a senior citizens holiday breakfast on Saturday, Dec. 1, at Piqua Central Intermediate School, 807 Nicklin Ave. Doors open at 7:30 a.m.
No tickets are necessary for the breakfast, which is free to senior citizens who reside in the PCS district. The menu will include scrambled eggs, sausage links, sausage gravy and biscuits, French toast, hash browns, fresh fruit, juice and coffee. There also will be a performance by the Piqua High School show choir, “The Company,” at 9 a.m.
BRADFORD — The Bradford Ohio Railroad Museum will host its North Pole Express from 11 a.m. to 1 p.m. Dec. 8. Children will be greeted by the conductor, who will punch their tickets. They will be served hot chocolate by a porter and meet many other costumed characters. Tickets are limited for this event. The cost is $10 per child, which includes admission to the museum, a golden ticket mailed to each child, cookies, hot chocolate, a commemorative item and a visit with Santa Claus. It is $5 per adult, which includes admission to the museum and hot chocolate. Tickets must be purchased in advance at www.bradfordrrmuseum.org. TROY — Upper Valley Medical Center has received several accolades as part of Healthgrades’ latest quality achievement awards, including the Healthgrades Patient Safety Excellence Award™, placing it in the top 5 percent of hospitals in the nation for patient safety for the second year in a row. UVMC also was named a Five-Star recipient for esophageal/stomach surgeries and heart attack treatment. Healthgrades evaluates hospital quality solely based on clinical outcomes, adjusting for risk factors such as patient age, gender, and medical condition. https://www.dailycall.com/wp-content/uploads/sites/30/2018/11/web1_crayex_ornament_cmyk.jpgProvided photo This Crayex Corporation ornament is the latest in series of collectible “Made in Piqua” ornaments. The cost is $12.